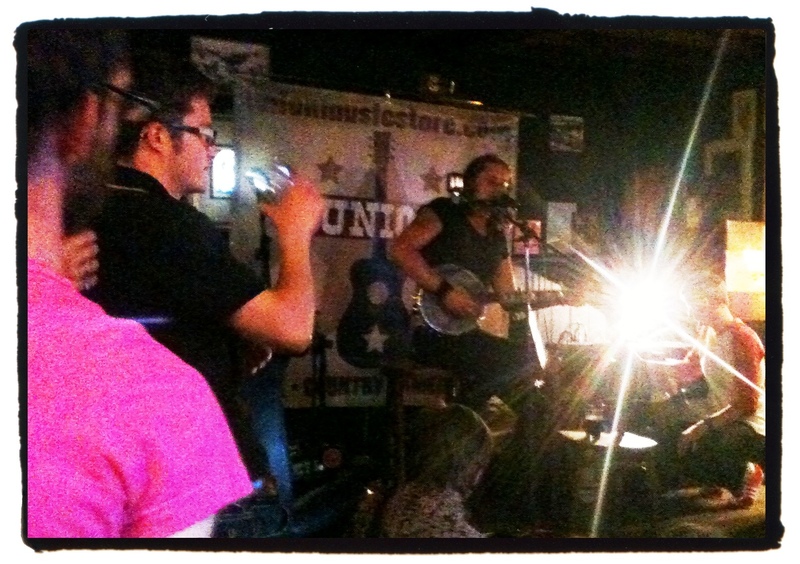 I only became aware of the first night of Lewes’ Union Music Store’s monthly residency at the newly refurbished and under new management the Lansdown Arms from a tweet. For that, I should be grateful to Twitter and my recent attempts to get to grips with this peculiarly codified means of networking. Still, along I went and shuffled into a seat alongside many of the Union’s regular punters, who do more than walk past in the morning before it opens, and again in the evening when all others are abed and stare longingly through the window at the collection of 12-strings, banjos and ukes. (www.unionmusicstore.com). The Lansdown Arms, now under the management of Viv and Ben, is fairly crowded as the first act, Stella Homewood kicks off. Sometimes her light, fluting voice and strummed, nylon-string, parlour guitar has trouble cutting through the babble, but for the most part she punches it out enough to satisfy the faithful gathered round with her warm tone poems of stillness and nature. At the end of one song, she promised that on the album, “Ordinary Day”, a full swell of instruments swept up at the end to push the song along to its conclusion, but here, there is space to breathe around the words. It is a gentle start, but filled with charm. (www.stellahomewood.com). What follows creates a shift in mood and atmosphere that gets feet stamping and heads nodding. Lloyd Williams, more normally the leader of Autumn Red, comes armed with his banjo and astonishing, hard picking virtuosity to deliver a set of tracks that remind me, not a little, of the bluegrass, metal covers of Hayseed Dixie who I saw at Kingston’s Ram Jam Club seven or eight years ago. The energy that Lloyd transmits is enough for one older member of the audience, resplendent in his straw cowboy hat to shout out “yeehaw!” – at the Union c*untry is not a dirty word, and you can even buy the t-shirt. Where Stella’s songs sung of England or at least a very English pastoral, slim, handsome and charismatic Lloyd’s songs of wishing wells and devils at the door seem closer to Steinbeck’s dust bowl and there are delivered in the evangelical bark of a frontier preacher. It’s an intense and dynamic set, and what it lacks, perhaps, in variety and subtlety in makes up for in the propulsive character of its playing. (www.myspace.com/autumnred). Finally, and headlining I suppose, although the atmosphere is more collective and communal than that term might suggest, is Laish, a multi-piece collective from Brighton, led by singer/songwriter Daniel Green (www.laishmusic.wordpress.com). Before they kicked off, I heard someone say that they were influenced by a traditional, folksy sound and looking at Green, who has something of the troubadour about him, and the cross-legged disciples sitting on the floor around them, this felt right; however, the first song came over a little Port O’Brien in the fusion of folk and indie reference points. After the first couple of songs, the band is joined by Martha Rose, who adds extra, elegant harmonies and folksy violin to the mix, her vocals lending depth to accordionist Emma’s, in support of Green’s slightly nasal lead – I kept thinking of Anthony Newley/Bowie/Nick Drake/Mark Chadwick, but there are probably better comparisons out there. It turned out that Laish had to miss the Pells Pool party earlier in June and offered up “I Am Enraged”, a song about moving to Lewes at the behest of a loved one that culminates in the refrain “you can go on your own” by way of a skewed and funny “apology”, much to the delight of the locals. If I’d heard it six months ago, well, who knows…? At the end of the set, another member of the congregation leaned over and said that it reminded him of 1967, the summer of love and all that “English psych.” He could have been talking about Laish or the evening as a whole, which certainly felt like a love-in. And yes, I loved it too. This sort of thing will, I suppose, always be hit and miss on occasion, but the sense of community that the Union Music Store has created already, and which this night supplements, is a credit to their enthusiasm and knowledge of the Americana, folk and roots scene. The next gathering is on Sunday, 4 September. I suggest you put it in your diary and pop along. Oh, and don’t forget to take some change along for the tip box.